Winter Games 2016, on Feb 20th, will be our first challenge of the season. It will be a great time and experience for the kids and families. As part of our preparation and training for the 2016 USAT Taekwondo Nationals, we have scheduled 5 to 7 tournaments that we will be participating to enhance our athlete’s techniques, skills, conditioning and so forth. 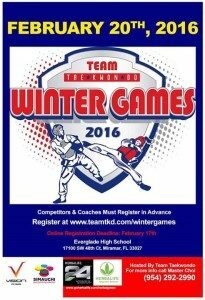 Make sure to register online (www.teamtkd.com/wintergames) and send the confirmation to g3america@gmail.com. Instructor Lucas and his team will be in charge of picking up all the credentials to make it easier on everyone. Details about transportation and time will we should be there will be discussed during the training sessions.